Dumb Lawsuit of the Day: Where’s the Beef? When you buy fast food, isn’t it assumed that the emphasis is more on fast and less on food? Apparently not in the case of Amanda Obney of California, the latest person trying to shake down a restaurant chain for quick cash. Obney and her lawyer, Jackie Chiles, er . . . W. Daniel “Dee” Miles III of the Montgomery, Alabama law firm Beasley Allen, filed the dumb lawsuit of the day, accusing Taco Bell of low meat content and protein value in its ground beef taco filling. Um, is this really the stuff of a necessary lawsuit? Is this woman really wronged here? Did it ruin her life when she and her lawyer sought the ingredients for Taco Bell beef filling and determined that only 35% of it is solid material and only 15% of that is protein? Obney and Miles are seeking more than $5 million from Taco Bell. 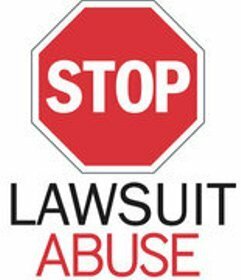 Read the lawsuit complaint. Um, hellooooo? IT’S. TACO. BELL. It’s not Pritikin.This isn’t the place where you go to get high nutritional value. It’s the aplace potheads and drunks go to get empty calories at 1:00 a.m. Next, someone will be suing Taco Bell for not being legitimate Mexican food, another claim–along with high nutritional content–that Taco Bell has never made. This is about one thing and one thing only: an easy cash shakedown by Obney and her lawyer, Miles. Named plaintiffs in class action suits, like this one, get large payments, and lawyers make hundreds of thousands of dollars–often millions–for their, um, “work” in these often baseless suits. And Taco Bell won’t pay the price here. You, the consumer, will. For the record, since I keep kosher, I don’t eat and have never eaten at Taco Bell. But I feel for the fast food chain’s customers who will literally pay the price with higher food prices to pay to settle this absurd suit. Maybe the restaurant will change its slogan from, “Think Outside the Bun,” to “Think Outside the Sleazy Lawyer’s Office.” Yo Queiro an end to the litigation explosion. Debbie I’ll eat foods that could be Kosher. I go to Taco Bell and special order stuff with beans instead of meat with extra lettuce and tomato. They always think I’m a kook but I feel it’s the right thing to do. I knew it couldn’t be Los Angeles! It had to be some dumb little southern place. LA is where you can’t get an attorney to represent you, even for anything ‘legitimate’, unless you hand him/her a check for about $10,000.00 first. To who ever wrote the blog about it had to be some dumb little southern town. You can PHUC OPH you west coast PHUC!!!!! Debbie, she does have a point. If Taco Bell advertises their ground beef filling as 100% beef then TB is guilty of fraud through false advertising. I work for a company that helps various meat processors throughout the world get their products approved for sale in the US by USDA. There are very strict labeling guidelines as to what can be called “hamburger” and what can not be called hamburger for example. Mike said, “If Taco Bell advertises their ground beef filling as 100% beef then TB is guilty of fraud through false advertising.” Mike, where did you read or hear that? They never said it. They said it was 100% USDA inspected. You work in the beef industry you should know the difference. On the surface the case appears to hinge on the concept that “seasoned beef” does not extend to beef with fillers and extenders. Sounds pretty shaky to me. I suppose the right jury will go for it but it would be tossed out on appeal. Lots of meat for lawyers on both sides, though. As you can see, beef is the primary ingredient, followed by water and then a seasoning with the other ingredients. No sign of any filler in the seasoning, but there is use of soy and wheat products in the seasoning (soybean oil and oats). Alabama is Tort Hell. Practiced Medicine there for 7 years. I just read that Taco Bell will countersue. Think if companies did that more often against frivolous lawsuits. They would stop quickly. Seems like a good method of defense to expose the initiator to the same treatment. So, this is not a case of injury or death, but of someone who is not happy about her Burrito or Taco Supreme. Is that really worth over $5 million in damages? The simple answer is the same for all really. If you do not like the restaurant or fastfood, do not go back. Taco Bell provides low cost meals for people of limited means. People who do not have $15-20 to blow at a reataurant are quite grateful to have such places where they have to option of eating in or taking it out. These attorneys are really inflicting a blow against the poor for personal gain. With the Republicans now in charge of the House and possibly the Senate in 2012 let’s start talking about tort reform. Cases like this (and their lawyers) should be thrown out of court with a stiff fine. As night follows day, every lawsuit has a counter suit. Not always. For example, most MDs do not countersue those who sue them for malpractice, even though they win 90% of the time. Another hit on the consumer. Simple solution: If you want real Mexican food, go to a real Mexican restaurant. Being in California, there is no shortage of Mexican taco shops. Any place that has hot sauce in packets can’t be taken seriously. Taco bell is good for cheap, mexican-style food. I never go there expecting a real mexican meal. If I want that I head to the real mexican joints which are absolutely delicious and about the same price. Taco Bell is for when I have no time or those places are closed. All of ya’ll are wrong about this women. And if you really read up on this lawsuit like you should debbie before you write a blog on it, then you would realize that she does not want the money. So why dont you leave her alone and do some research next time before putting false information up. You people have got it all wrong, and if your gonna say something about it you should probably know and get your facts straight. And you debbie should know what your talking about if your going to freaking write about it. for your info and everybody else’s she is not suing for money. Just simply google it and you’ll know that much.